A couple months ago, I created a Sketch document to assist with the design of block-driven themes. I posted about that here on Themeshaper, and provided a couple short examples of how it could be used in a theme design workflow. Allan and I set out to experiment, learn, and create a resource for the community. We’ve documented our experience designing and building this theme, and will be publishing our notes in a series of posts here on Themeshaper. Our design goal for the theme has been to show that it’s possible (and encouraged!) to make a Gutenberg theme that doesn’t necessarily look like Gutenberg. We wanted to create something bold and a little experimental; a theme with somewhat aggressive, non-standard styles. You’ll be happy to hear that the overall theme development process wasn’t all that different with Gutenberg. Common patterns like headers, footers, and loops work just as you’d expect in a Gutenberg-powered theme. In many areas, Gutenberg makes things easier for both users and developers. 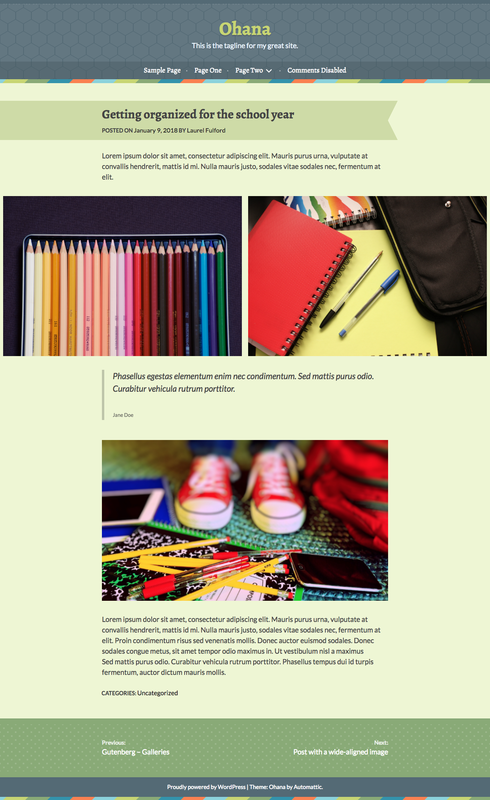 For instance, full-width header images used to require a custom-built customizer or theme option solution, but now they’re essentially built in. This was important to keep in mind while building the theme, and was a very positive change for development. Creating stylesheets for blocks was pretty straightforward. Expanding on the built-in stylesheets in _s, we added a blocks.scss file to the SASS directory and placed all of our block-specific styles and overrides there. This kept everything nice and organized and is likely to appear in _s in the future. Since Gutenberg is output by the_content(), we learned to take special care with any wrapper divs that might clip or obstruct the expected behavior of Gutenberg blocks. We’ll talk more about that in a follow up post. We’re truly excited about the custom editor styles that ship with Music. These styles are a breakthrough: they give users a much clearer sense of what their visitors will see on the front end. Best of all (for theme developers at least), the editor styles were a breeze to integrate! We built all of these in over the course of just a few hours. In many ways, designing and building this theme was similar to the way we’ve made themes in the past — but we did carve out a few new practices along the way. Allan and I will be sharing them with you in upcoming posts. In the meantime, we encourage you to download, install, and experiment with Music yourself! At the Automattic Theme Team meetup in December, we focused on several Gutenberg-related projects. The first one we’re sharing is a set of Gutenberg-friendly themes based on Underscores. The project’s goal was to help us think about our themes differently, dig into adding theme support for Gutenberg, and as a byproduct, do some testing of Gutenberg itself. Six team members participated in this project, and it resulted in three themes which are still in progress, and currently available on GitHub. Gutenberg is the new block-based content editor currently being developed in GitHub for WordPress 5.0. Until it’s merged into core, it’s available as a plugin. The three themes we developed during the meetup are called Fashion Blog, Handicraft, and Ohana. We decided to try to make these themes CSS-only to help keep the focus on Gutenberg itself and let us build on the recent work the team’s been doing with Style Packs. This turned out to be an ambitious restriction — a little more on that later — but it made for an interesting design challenge. 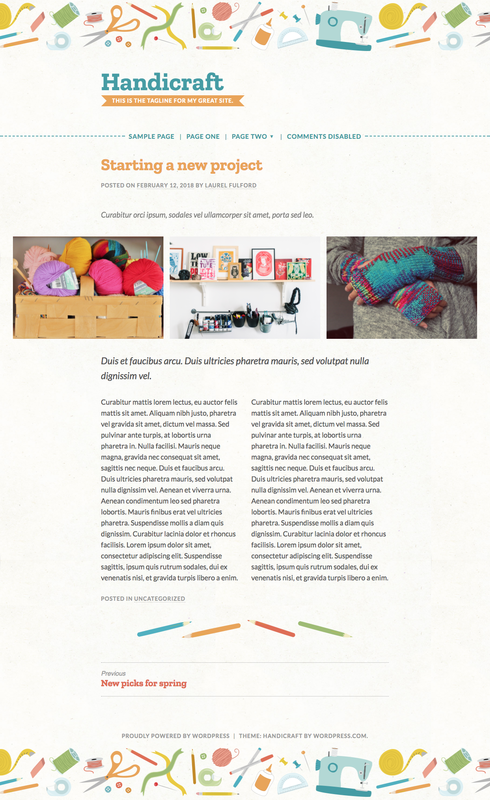 Fashion Blog, Handicraft and Ohana are currently available on GitHub; you can learn more about each theme there and check out exactly how they were set up. The themes are still works in progress and have some rough edges. The end goal is to get them ready for WordPress.com. Over the course of a few days, we researched and decided on an audience for each theme, designed and built them, and added Gutenberg support. We opted to use a one-column design for all three themes, to best accommodate the “full” and “wide” block alignment options in Gutenberg. 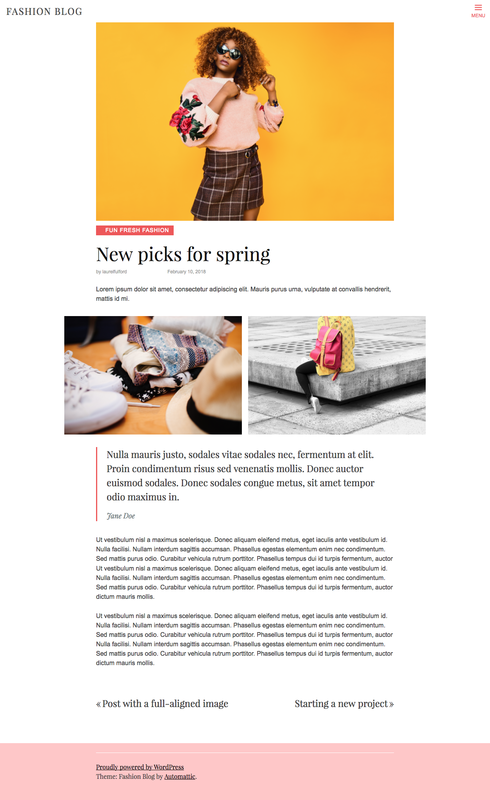 Though it can vary from theme to theme, this is how Handicraft styles Gutenberg’s wide alignment (on the left) and Fashion Blog styles the full alignment (on the right). You don’t actually have to do anything to use Gutenberg with a theme, but by declaring theme support you can add two optional features: the “wide” alignments (full width and wide width), and custom colors for the block-color palettes. Whether or not you include custom colors in your theme, Gutenberg will always include a color picker with the palette, for further customization. Gutenberg’s default color palette, shown while editing the Button block. In general, the default blocks don’t need styling — Gutenberg already includes styles that match each block’s functionality. For example, the Gallery block already has the styles needed to split your galleries into different columns, and the Cover Image block will place the text and image added on top of each other, without the theme’s help. If any of the styles don’t fully suit your theme’s design, you can adjust them as needed. One thing we noticed while we were developing these themes was Gutenberg’s distinct pill-shaped button style, which might not work with every theme. On the flip side, themes are fully responsible for figuring out how the “wide” and “full” alignment styles should be handled, if they support them. This makes sense, since support is optional, and exactly how they should look can vary depending on a theme’s individual style. At the time of writing, the Gutenberg theme styles these two alignments by setting max-widths for specific HTML elements, with a wider max width when either the .widealign or .fullalign classes are used. This approach works, but because vw includes the width of the vertical scrollbar as part of the whole screen width, you can get a little horizontal scrolling. One fix is adding overflow: hidden to one of the page-width elements further up the HTML tree. If you didn’t want these elements’ widths to be based on screen size, you could also set a specific max-width. There’s no one “right” way to approach these styles, and I’m sure more and more examples will come out of the woodwork as more themes add styles for Gutenberg. For example, Justin Tadlock has shared his method using different calc values, and Joen Asmussen has blogged about his approach of applying max-widths to all child elements that aren’t wide or full width. In our themes, we also kept any block-specific styles separate in their own stylesheet. To make the editing experience more what-you-see-is-what-you-get, you can add Gutenberg editor styles using enqueue_block_editor_assets. It’s similar to how editor styles can be enqueued for the current TinyMCE editor. This makes sure what a user sees when building their pages best matches how the content will actually look with your theme when published. An example of Ohana’s editor styles. The editor styles need to be pretty specific to make sure they’re not applied to other elements of the page outside of the editor — Rich Tabor has a good post here about his experience with this behavior. Gutenberg includes specific classes around different elements in the editor, so you can prefix selectors more generally with the class .editor-post-visual-editor, or use more specific classes to target individual blocks — for example, styles for .editor-block-list__block[data-type="core/heading"] h1 would only be applied to h1s inside of a Heading block. The Gutenberg default block styles are numerous and can be a bit opinionated. This is good, in that you can rely on Gutenberg to do a lot of the heavy lifting, but there are some styles that would need to be updated to match individual theme styles. It can be tricky to set up the wide and full-width styles; as more themes add styles for Gutenberg, it’ll be interesting to see all the different ways themes handle this. Setting up the block styles for the back-end editing experience was more involved than any of us had anticipated. It’s very much like adding editor styles to the current TinyMCE editor, but some Gutenberg blocks have very specific classes that needed to be overridden. From a project-planning perspective, we could have spent more time narrowing down the kinds of themes we wanted to build — and the actual designs — prior to the meetup. This would have left more time to focus on the Gutenberg part of each theme. In the end, it wasn’t possible to complete the project without making edits to these themes in addition to CSS. On top of the PHP changes needed to support Gutenberg’s optional features, we needed to make edits for common WordPress.com-functionality — like adding social menus, and more Content Options support — and for the designs themselves, like enqueuing Google fonts. Our goal is to get these themes launched on WordPress.com. To get there, they still need some WordPress.com-specific functionality, like the annotations for WordPress.com’s custom fonts and colors, WooCommerce support, and styles for WordPress.com widgets. We hope that sharing this process is helpful for your own Gutenberg journey as themers. We’d love to hear about your adventures. In the last year, we’ve gotten a lot of questions from the community about Underscores and whether we had abandoned it. No way! It’s a stable project, and we enjoyed working on something new, away from it. It gave us better perspective and more ideas for the future of Underscores. It’s always hard to let go of a project, in this case, Components. But it shouldn’t be, when you walk away with more knowledge than before. It has us excited and reinvigorated about Underscores and its role in the future of theming. And we’re glad Ulrich will help us along the way! For the latest ThemeShaper remake, we added Featured Content to Twenty Sixteen. That’s standard, but our design called for not showing the featured image of every post, but only the latest post. That image serves as a backdrop to our collection of featured posts, which can be from one to three posts at a time. It’s a neat design pattern, so I thought I’d share the code needed to grab that image. First, we need to grab the featured posts, and check to make sure there are some posts. If there is, we assign the post ID of the latest post to a variable, $post_id. We’ll need that later. Next, if the latest post has a post thumbnail, we create another variable, $big_post_image, and use it to assign the actual output of the image URL. Finally, we output the markup. It outputs as a style attribute, and you can then style the rest via CSS. In your theme, you just attach the function to the div or html element you want to apply the style on. That’s it! Hopefully, this code snippet helps you in the next theme you create. Happy theming! With the release of Jetpack 3.9 last month, we introduced a new tool available for all theme developers: Social Menus. It allows site owners to create a new menu location which is used to display links to Social Media Profiles. Theme developers can add support for a Social Menu by following these three simple steps. Step 1: Declare support in a function hooked to after_setup_theme. Step 2: Create a new function to avoid fatal errors if Jetpack isn’t activated. Step 3: Use the function created in step 2 to output the menu where you would like it displayed in the theme. Once you’ve created a menu, Jetpack will automatically enqueue a basic stylesheet to style each one of the menu items, thanks to Genericons. You don’t have to do anything else! If you’re making themes, Jetpack allows you to easily add additional functionality to your themes in a consistent way without a lot of overhead — and without accidentally wandering into “plugin territory.” Here at Automattic, more and more of our themes take advantage of Jetpack to implement site logos, featured content sliders, testimonials, portfolios, food menus, and other special functionality. The trouble is that users don’t always realize they need to activate Jetpack in order to turn on this functionality. With so many installing themes directly from their WordPress dashboards, most users don’t even know where to find a readme file. As a result, we saw tons of confused users posting in the WordPress.org forums, asking how to make their sites look like our demos. What we needed was a way to easily inform our users that their theme relied on certain Jetpack modules, and help them install or activate them as needed. This would save on support time as well as make our users happy. We also needed a solution that would be easy to add to lots of different themes, without requiring a lot of manual labor. We’ve been working on a solution to this problem over the past few months, and we’ve come up with a simple script that helps our users figure out what’s going on. Since starting to use it in our themes, we’ve seen the number of support requests drop substantially. Since we love open source, we’ve made the code freely available on Github — so you can use it, too! * Load plugin enhancement file to display admin notices. You’ll want to replace all instances of textdomain in the script with your theme’s text domain, since it adds a few new strings. You’ll also want to regenerate your theme’s POT file once that’s done. Here’s how it works in Sela, which uses a Site Logo and the Testimonials custom post type. The notifications appear on the user’s dashboard and on the Themes and Plugin pages. The notifications can be dismissed so they don’t annoy users who don’t want to use Jetpack. The script checks for theme support first, then checks to see if the required plugins (Jetpack) and modules are activated. It then builds out notifications tailored to the user’s individual situation, so that users are effectively guided through the process of installing and activating the plugin. Presto! In only 366 lines of code, we have happier support people and happier users. Feel free to use this script in your own themes, or remix it for your own purposes.